Although GT3 isn't packing any of Dodge's vintage muscle cars that substantiated most of their presence in GT2, we feel that the modern styling and performance of the GTS is successfully filling that void. From the base model GTS to the tenacious GTS-R Prototype, Dodge has you covered. The very first prototype Viper was unveiled at the 1989 Detroit Motor Show, and the production version was released in 1992, three years later. Naturally its name and its glamorous wide and low form are suggestive of reptiles, being built entirely of plastic body panels draped over a tubular frame. The suspension equipped with 27-mm diameter stabilizer bars, which is a double wishbone both in the front and the rear. This snake slithers on P275/40ZR17 fat tires in front and P335/35ZR17's in back. The midship-mounted engine is a V10 OHV unit with a displacement of 8.0L. The engine was re-tailored for sports car use with the help of a Lamborghini engineer. Thus, while it is a bit old-fashioned with 2-valve pushrod configuration, it has a dreadfully sharp response, and generates enormous power. The transmission is a Borg-Warner 6-speed manual and the brake calipers are made by Brembo of Italy. Equipped with a clutch-type limited slip differential (LSD), the rear-wheel drive body with such a heavy curb weight gives such a hearty ride it could be a modern-day Mopar muscle car. 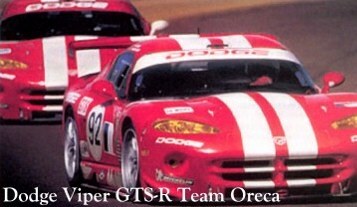 No one can dispute the fact that even in their stock forms, all three version of the Viper GTS are incredibly nimble and ridiculously fast. Make sure you visit Mopar Performance to make the most of your Viper GTS.